Step 1. Set Up the initial meeting, and getting people involved. The members of the community must be first be informed about plans to form a neighborhood watch. A good way to go about it would be to go door-to-door, handing out fliers or leaflets that contain information about the proposed neighborhood watch as well as the schedule of the initial meeting. Step 2. Identify the security concerns. During the meeting, the members of the neighborhood watch should discuss and identify the most pressing security issues or problems confronting their community. These could range from reports of the presence of strangers to burglaries and other crimes. When discussing these, transparency is very important, and community members must not hold anything back. Step 3. Determine ways to address security concerns. After identifying the security concerns, deciding on putting up a neighborhood watch should be the first order of the day. Assigning two captains per block is a good start. This will increase security visibility and deter crime. The captains can form a patrol and will be in charge of everything that happens in their assigned block. The patrol can be on a 24-hour schedule, or if this is not possible, a 12-hour schedule. Neighborhood members must also be trained to spot any unusual activity or unfamiliar faces within the area, and learn how to immediately contact the proper authorities. Step 4: Deciding on the frequency of meetings. Once the watch has been implemented, its members must decide how frequently they must meet. This can be weekly, monthly, or bi-monthly. During the meetings, the captains will report any new issue or progress on old issues. 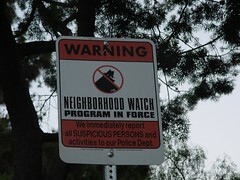 For a neighborhood watch to be successful, it requires the participation of all members of the community. It is all about watching each other’s backs and being each other’s eyes and ears. Even when the crime rate is low, there should still be an organized that will prevent robberies and other illicit acts from happening. Organize Luau Party – Organizing something for family and community. Neighborhood Watches are a great way to help ease away feelings of being threatened and make people within a neighborhood more secure. In order for it to be successful, participation from the majority of the homeowners are needed and meetings must be conducted on a regular basis. It also helps if there people within the community that are associated with the local police departments, so as you can directly report to him and most likely you make him the president or leader of the Neighborhood watch. Not only does this make owners feel more secure within their community, this also helps in establishing camaraderie and friendship within the community. It is best to have everyone involved in the neighborhood watch. Neighbors should look after each other. Women and teens can help by engaging into self-defense trainings in their local police department. Do not hesitate to ask for assistance in your local government units because there is usually a useful program that provide these type of preparations. Teach young adults to be active in propagating awareness like facilitating town meetings or assembly. Kids should be instructed on what to do since they are the most likely targets of criminals.